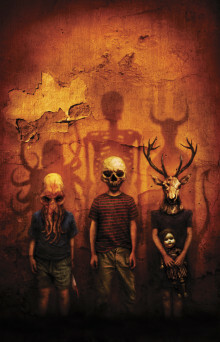 The Dark Magazine is a quarterly dark fiction magazine edited by Jack Fisher and Sean Wallace. which features great short fiction both in print in audio. This months issue features the brilliant artwork by Vincent Chong an award winning freelance illustrator and designer. He has illustrated works by many authors including Stephen King and Ray Bradbury. This short story examines how it is folly to ignore the past and our heritage, that no matter how evil man can be there are creatures out there which are far worse. Steve Berman sold his first story at seventeen and has never looked back. His novel, Vintage: A Ghost Story was a finalist for the Andre Norton Award. Frank dedicates his life to finding missing people but the one he truly wants to find remains forever elusive. This is a poignant tale of finding peace and salvation and the pain we put ourselves through and the prisons that we form around ourselves. Kaaron Warren is a Bram Stoker Award Nominee, twice-World Fantasy Award Nominee and Shirley Jackson Award Winner. She has sold more than 200 stories and has written three novels, Slights, Walking the Tree and Mistification. Her latest novel, The Grief Hole, will be released in August from IFWG Publishing Australia. Caroline comes to Ireland to mourn the death her sister who she had spent a lifetime of living in her shadow and doesn't know what to do next. This is a story of roots and belonging and the pain that is felt when you are ripped away from where you truly belong. Angela Slatter is a dark fantsy and horror author of the Aurealis Award-winning The Girl with no Hands and Other Tales. Her short fiction has previously been published in Mammoth Book of New Horror 22, Fantasy Magazine, Lady Churchill's Rosebud Wristlet , Dreaming Again and Steampunk 11:Steampunk Reloaded. Her short story The Coffin Maker's Daughter won a British Fantasy Award.